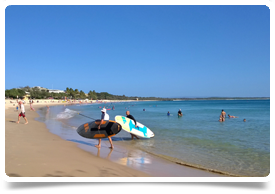 This family run General Practice is located in a gorgeous coastal town in New South Wales, and has an opening for an experienced GP to join their established team. Have you considered working in a rural location but wondered if it would suit the family? Do you want high earning potential in a flexible GP position? This coastal town has lots to offer people of all ages. 60% billing with estimated minimum income of $280,000 on 35 hours per week. No out of hours unless you want Emergency (Visiting Medical Officer) work at the local hospital. Ten minutes from one of Australia's top surfing beaches and 2 hours from Gold Coast, the practice is ideally situated to enjoy a chilled lifestyle and allow for weekends away in Sydney, Byron Bay, the Gold Coast and Brisbane. The nearby airport has flights that travel regularly to destinations across Australia so if you are seeking a relaxed country town with amazing scenery and plenty to keep the family amused, with the option of jetting off to the bigger cities when the mood takes you, call us for more information about this great practice. This region is also a paradise for surfers, so whether you are looking to take your first lesson or are mastering the waves already, the beaches along the North Coast are the perfect place to do so. If you prefer to stay out of the water, go horse-riding along Seven Mile Beach or wind down with a massage or yoga session at one of Byron’s many rainforest-fringed spas. There are 29 Primary Schools and 6 Secondary schools (government and Independent) plus TAFE campus in the region.